This winter, it’s always important to keep your home clean, not only to impress your friends and family, but to prevent your child from getting sick during the colder seasons of the year. Caring for your children means caring for your home, even if you don’t always have the time to sweep or mop your entire house. Below, is a guide on how you can get a start on cleaning your home this winter, and in turn, take better care of your children. A great way to start cleaning your home this winter is to sweep, dust, and mop. Generally speaking, you want to disinfect and keep your entire house dust-free. This is because dust or other air particles can cause your child allergies and irritate their sinuses. Fortunately, sweeping and dusting your home a few times a week is easy enough to do on your own. Now comes the harder labor when cleaning your home, such as removing clutter from your house. Keeping old junk around your home can lead to an increase in bacteria, which can negatively impact your child’s life and lead to some pretty nasty illnesses. To avoid this from happening, you should hold an end-of-the-year yard sale or donate all your old junk to a local charity. Either way, it’s got to go! If you don’t have the time to clean your home this winter, you should plan on hiring a local cleaning service every week to do it for you. Remember, not having the time isn’t an excuse for not having a clean home for your child to grow up in. If you’re a busy worker, your kid will probably spend more time at home than you. You don’t want their time at home to include getting sick on the regular due to a dirty house. Not to mention, a messy home can lead to some severe pest infestations that can affect you, your child, and your home. To get rid of a pest infestation in your home, which can put affect just about everyone, you should first do your best to identify the type of pest that’s living in your house. Fortunately, ants are pretty easy to identify, but smaller bugs might require assistance from a handy exterminator to locate and remove from your home. You can go one of two routes for getting rid of pests in your home: setting up traps in your house or contacting a local exterminator to do it for you. However, setting up traps are often the more affordable route to get rid of pest infestations in your house. To figure out what kind of traps you need, visit your local hardware store and ask the staff for the proper traps that will exterminate the pests you’ve identified crawling around your home. Now all you have to do is set them up and enjoy a less buggy house. Another way you can get rid of pests from your home and away from your child’s environment is to hire a local exterminator. Although you may need to leave your home for a few hours, depending on how severe the infestation is, it’s the most effective method for removing pests from your home once and for all. However, make sure you do plenty of research to find the best exterminator in the area, such as Broadway Exterminating in Uptown, NYC. If you have a child, you know how important it is to take responsibility for them and ensure they have a safe home to live in. This includes cleaning the environment they’ll be interacting in on the regular, as well as getting rid of pests that may try making your child’s bedroom their new home. This winter, make sure you maintain your promise to be a dutiful parent and keep them safe in a clean and pest-free house. Caring for your home is not only a part of being a good parent but also being an excellent example to your children. After all, they will follow in your footsteps, whether you like it or not. This makes today an opportune time to show them what it means to carry responsibility by keeping your home clean and free of harm. Although this may seem like a lot of work on your shoulders, you have surrounding friends and family to help you out whenever you need a hand. You’d be surprised how helpful having this kind of support is, especially during this busier times of the year. As hard as it may be, every mess your child makes is your mess too. You shouldn’t ever punish your child for having an accident. By caring for them and your home, you’re fulfilling your duties as a parent, which is something your kid can look up to. Parenting may be no easy job for everyone to undertake, it does have it’s advantages, such as being able to bring a child into the world. Before you know it, they’ll be taking care of you. Caring for your home translates to caring for your children. 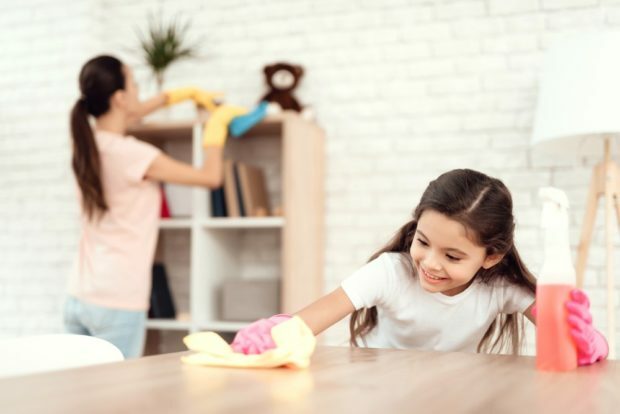 From dusting and sweeping the surfaces of your house to getting rid of pest infestations, maintaining your property allows you to maintain a clean and safe environment for your kid(s). Although keeping a significantly large home clean is never easy, it’s your role of a parent to keep it so. Now that it’s winter, it’s never been a better time to get a head start on your cleaning to impress house guests and keep your children safe at home.